Errol Flynn is Don Juan - the dashing, duelling legendary lover and swashbuckler. The 17th Century rake has reformed his wicked ways and now prepares to die for the glory after uncovering a dastardly plot against the Spanish Royal Family by the evil Duke de Lorca. King Phillip III and the beautiful Queen Margaret are unaware of the treachery afoot. But Don Juan is in like Flynn to save the day in a magnificent epic extravaganza. 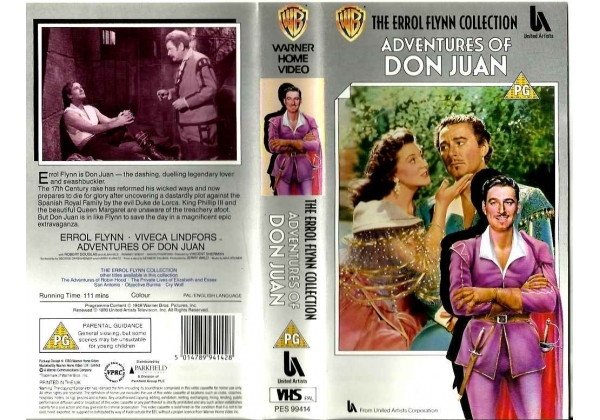 Or find "Adventures of Don Juan (1949)" on VHS and DVD / BluRay at Amazon.